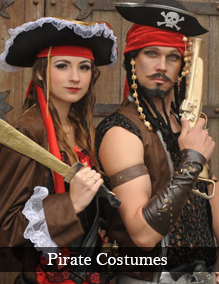 Bawdy Pirate fancy dress costume from a Real Plus 18-40. This costume is made to order, please allow 5-7 days for delivery. 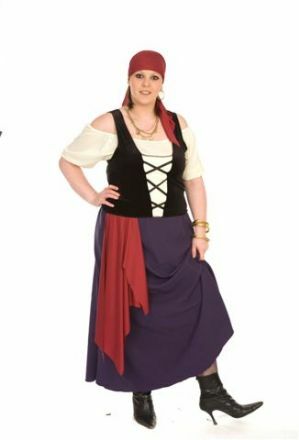 Bawdy Pirate costume includes a purple velour skirt with elasticated waist. White Gypsy style top. Black overtop with laced effect bodice to give the effect of a waistcoat with attached red pirate sash. Also includes matching bandana. A very flattering costume and easy to wear.